5 thousand miles, 5 breweries, 2 countries, 1 cause. Sesiones del Migrante is a series of beers brewed for the first time in 2017 in collaboration with Mexican and American breweries to celebrate the Mexican migrant workers who travel to the Yakima Valley to harvest hops for breweries across the globe. In 2018, the partnership continues among the founding breweries and YCH Hops. 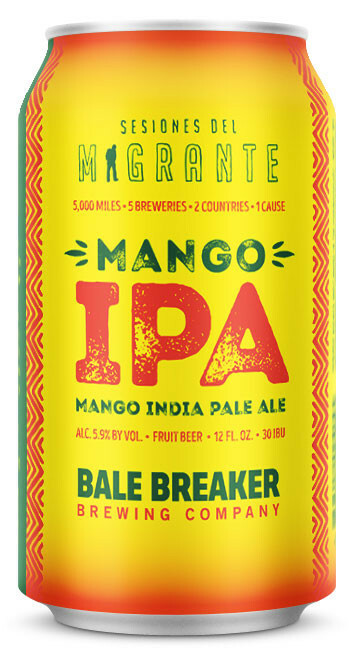 Look for a new Mango IPA from Bale Breaker Summer 2018. Release event is July 19, 2018. We are proud to support La Casa Hogar with proceeds from the Sesiones del Migrante Mango IPA. Sesiones del Migrante: A conversation with Roberto Polina Sr.
La Casa Hogar's mission to connect and educate Latina families. The Beer: 2018 Sesiones del Migrante Mango IPA (5.9% ABV 30 IBU). In early August 2017, brewers from all four collaborating breweries came to Yakima to brew Bale Breaker’s inaugural Sesiones del Migrante Mango IPA featuring the freshest Yakima Valley hops. Sesiones del Migrante Mango IPA will be released again for Summer 2018, and a portion of the proceeds will again benefit La Casa Hogar, a Yakima non-profit that connects and educates Latina families. “We’re happy that this brewing collaboration will create awareness of the hard work of Yakima’s Latino community. Their work both during harvest and year-round is essential to creating the hoppy beers everyone loves,” said Meghann Quinn, owner/business manager at Bale Breaker. "We look forward to this partnership continuing into the future."